Designed by Gérald Genta (1931-2011) in 1972, the Royal Oak was the first steel luxury wristwatch. Over the past four decades, it has become the icon of the storied Swiss manufacture — Audemars Piguet. Located in the Vallée de Joux, and still in the hands of the founding families, AP sits among an elite few at the top of the Swiss watch range. When the Royal Oak first came out a number of competitors reacted, but none more successfully than Patek Philippe with the Nautilus (which was originally launched in 1976). Both the Royal Oak and Nautilus are still in production, and still to this day it is a common argument between enthusiasts and collectors as to which one is better. And while we will not be able to give you a definitive answer as to which one is a better choice or a better investment — if the Royal Oak is your preference, then hopefully this article will help you decide which particular variation might be best for you. When the original Royal Oak first came out, it was nicknamed the “Jumbo” because of its 39 mm diameter, which was considered oversized at the time. Eventually, the Royal Oak was produced in a 36 mm case size, and then in a 39 mm diameter, up until last year. The outgoing 39 mm production model did not have an in-house made dial, and the logo was applied in place of the 12 o’clock hour marker. Now, as of SIHH 2012, the Royal Oak comes in a 41 mm or a 37 mm case, with the 39 mm being reserved exclusively for the (Royal Extra-Thin “Jumbo” and Royal Oak Skeleton models). Even as nice as the case and bracelet are, it’s the Royal Oak dial that takes my breath away. The new Royal Oak now has the AP logo applied to the dial just below the 12 o’clock marker, allowing for the designers to add a real hour marker for 12 o’clock, which, in this case, is a faceted white gold applied double baton marker, a major improvement aesthetically. 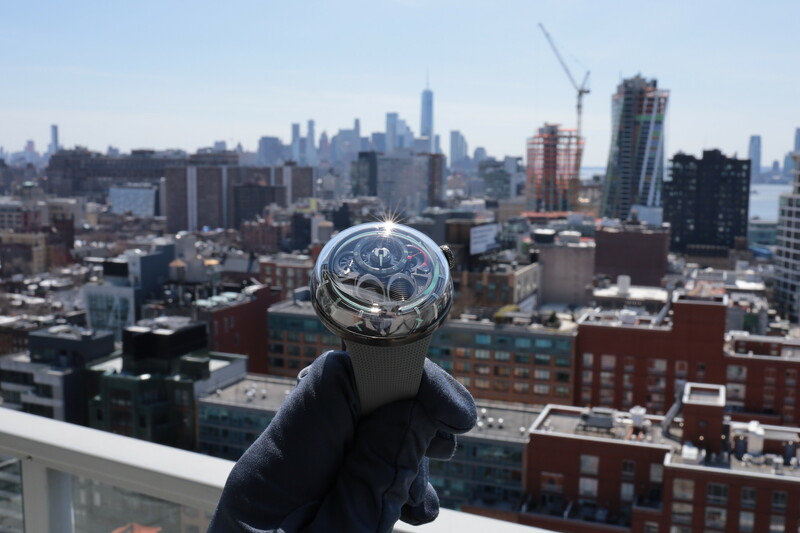 Measuring 41 x 9.80 mm — the new Royal Oak is only slightly larger than its predecessor, but as I mentioned above, the dial is also vastly improved. And the case back is now open, something not previously offered within this collection. Which, of course, is a shame for any movement coming out of Le Brassus. And as I mentioned above, there is also a new 37 mm version for people with small wrists (or women). Which one works best for you truly matters on your wrist size and personal taste. I tried on all three and the 37 mm is definitely too small for my wrist (which is 7 inches in circumference), the 39 mm looks good and so does the 41 mm, so which one did I prefer? Read on and I will tell you. Fortunately, the Royal Oak’s case and bracelet are unique and highly distinguishable in an industry crowded with too many homogeneous designs. Needless to say, standing out is essential to success. 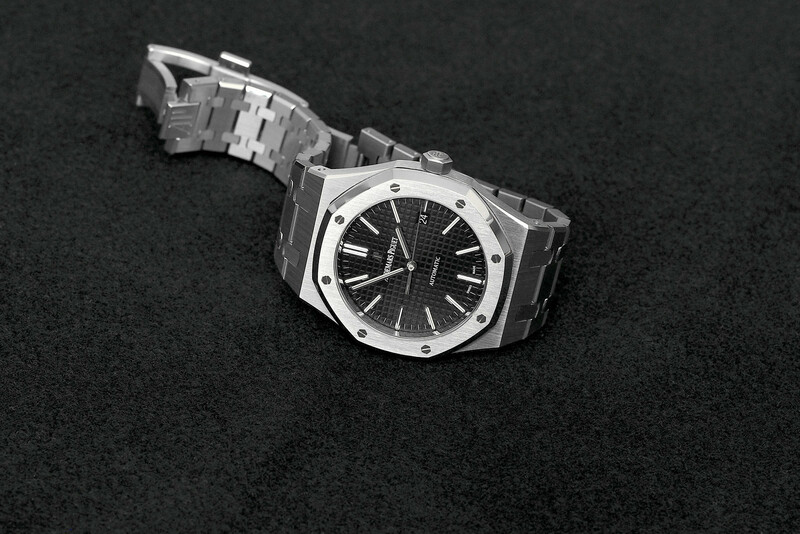 From the signature hexagonal bezel, with its eight fully functional, polished screws which contrast the vertically brushed top side and polished outer edge of the bezel nicely, to the perfectly bevelled polished case band and lug edges with contrasting vertically brushed sides, to the matching bracelet with its flawless polished and brushed facets — the finish and design of the Royal Oak are unmistakable. It attracts attention. But not the kind of attention you get from the diamond bezel of a watch or 20-inch chrome rims on a car. It is much more subtle and classy. Glareproofed sapphire crystal and caseback, screw-locked crown (engraved with AP logo). Water-resistant 50 meters. Stainless steel bracelet with folding AP-engraved clasp. Even as nice as the case and bracelet are, it’s the Royal Oak dial that takes my breath away. It’s one of the best design elements of the Royal Oak. The “Grand Tapisserie” motif pattern, white gold applied hour markers and long Royal Oak hands with luminescent hands, make the dial both very easy to read and to admire. The dial production was previously outsourced, but every Royal Oak made in 2012 and newer now features an in-house made dial. While testing the watch over the course of two weeks, I found that the dial is very readable, even at a quick glance, something that cannot be underestimated. Furthermore, I found myself more often than not, just staring at the intricate dial pattern and the faceted edges of the while gold markers. Aesthetically, it is so damn good looking that it is hard not to look at it. Like beautiful women, the back of the watch is as impressive as the front. 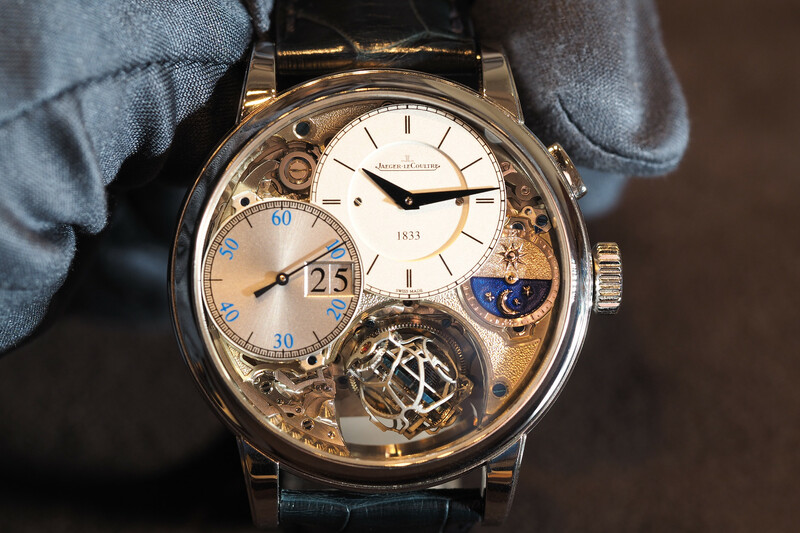 a look through the sapphire caseback reveals the beautifully finished self-winding movement. Caliber 3120 beats at 3Hz or 21,600 vibrations per hour (the Extra-Thin movement is thinner and utilizes caliber 2121). The bridges are finished with Cotes de Geneve, bevels of the bridges are diamond graved, inverted snailing on bridges with circular graining on the main plate, all done by hand operated machines. The automatic winding of the mainspring is handled by a beautifully engraved 22K rose gold monobloc oscillating weight, with increased efficiency thanks to ceramic ball bearings. Additionally, the rotor is bi-directional, meaning it winds in both directions, a feature that should hypothetically increase the winding efficiency. When fully wound, the 3120 has a 60-hour power reserve, which is nice as anything over the typical 42-hour power reserves seen on most watches, is welcome. A total of 280 components makes up the movement, 40 of which are jewels. The balance features variable inertia blocks, with a flat spring and a mobile stud. 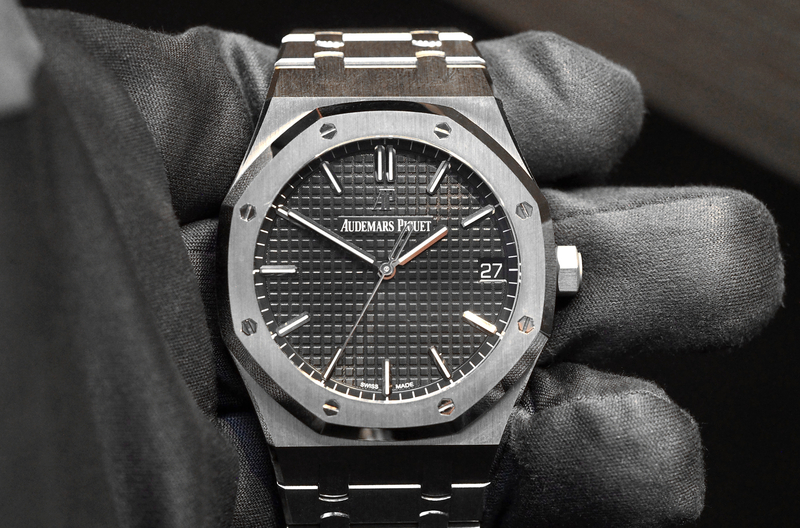 Royal Oak Jumbos do not have center seconds hand — just hours, minutes and date. This version “does” have a central seconds hand, hours, minutes and date. It also has a stop-seconds function, that allows you to stop the balance and, therefore, the seconds to more accurately set the time, a function that is pointless without a seconds hand. Indisputably, the Royal Oak “Jumbo” (new or vintage) is the ultimate Audemars Piguet collector’s piece, the one a purist would want. But if you want to save some money, and don’t mind the new sizes: 37 mm and 41 mm — then the new models are an excellent option. You get a great looking movement, the caliber 3120, versus the caliber 2121, which is also visually pleasing. You also get a sweeping seconds hand, whereas the Jumbo has no seconds hand. And at $16,700 — the price is considerably less.